Moflash Hooters and Horns range include a motor driven hooter, that produces the traditional unique ‘Klaxon’ sound which is the most recognisable sound in signalling. These products are used in factories all over the world from Birmingham to Singapore. The full range of Hooters and Horns including product specifications can be viewed below. 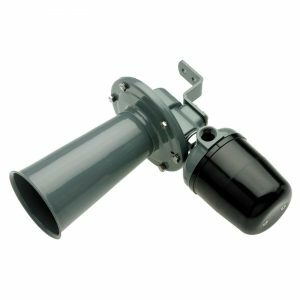 APPLICATION: The A1 motor driven hooter are ideal for use on small boats, canal barges, mine trucks and are effective warning devices.